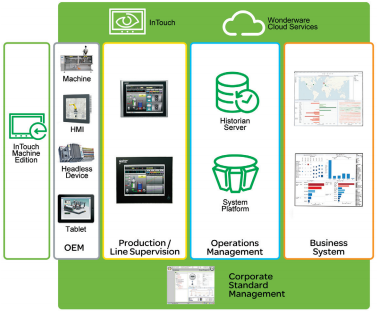 Wonderware: What is new in InTouch Machine Edition 8.0? Later this month we are releasing InTouch Machine Edition 8.0. This release has quite a few new features and improvements so we’re really excited to get this one out to you. Studio Mobile Access (SMA) – HTML5: Multiple Document Interface (MDI) to enabling you to access your graphical interface from any device. Portfolio Integration: Support for Wonderware Online storing and retrieving Trend Data directly on the historian on the Cloud. In this video you can learn about the first 4 features in this release. The new runtime, operating system agnostic IoT View will be cover later as a separate topic due to its importance for the market. Here is a brief description of IoTView. InTouch Machine Edition IoTView introduces a specially designed HMI platform custom-built to embrace new technology for connectivity. With the advent of Internet of Things and Industry 4.0, not only will the number of embedded devices used for M2M data exchange increase, but demand for machine functionality will rise sharply, including demand for interoperability, the ability to exchange data with cloud-based systems, and user-friendly local configuration and maintenance. Rather than an isolated set of units, these devices can play an integral role in the overall automation system (and even supply chain). IoTView is a natural expansion of the current set of runtime editions from Wonderware InTouch, from local HMIs to SCADA systems, with unique characteristics designed to make creating these connected intelligent systems a reality. IoTView combines a very small footprint with low system requirements with all the tools and functionality needed to develop sophisticated end point devices. The solution is scalable, reliable, and built around the same technology that makes InTouch Machine Edition one of the most full-featured and flexible HMI/SCADA solutions on the market.